Since I am a side sleeper only, this pillow is great for me. Love that it is scented with lavender, although I wish the scent were stronger than it is. Haven't seen one like this anywhere and am so glad I found it here at Overstock! The unique design of the Z Shoulder ZONED DOUGH Pillow offers ergonomic comfort for side sleepers. And the lavender-infused memory foam acts as a natural sleep aid that can also help regulate your sleep cycles. The included 2 ml lavender spritzer allows you to refresh the scent as desired. Amazing pillow!!!!!!!!!!! Highly recommend it! This pillow is what I have been SEARCHING FOR. It is amazing. For all you side sleepers- I can't believe the difference it makes having that cut out for your shoulder. It puts your head in the perfect spot on the thickest, most supportive spot of the pillow. The memory foam is amazing, so super soft and comfy, but very supportive. My head doesn't sink to the mattress through the night, the foam stays bouncy..it doesn't compact into a rock like other memory foam pillows I have tried. The lavender smell is really, really nice, and it comes with an extra little spritzer bottle. I am very impressed with this pillow and so happy I finally found the one! My neck feels amazing and I sleep so good! 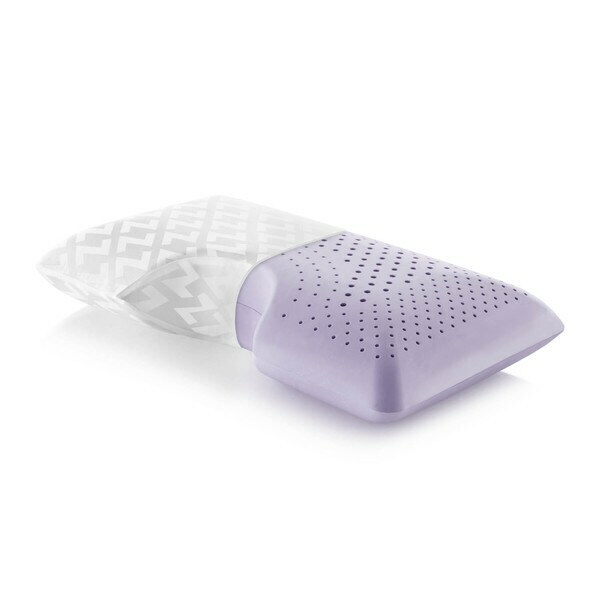 Very comfortable; I like the light Lavender scent; The only issue is that it was supposed to also come with a spritzer of the scent to refresh the pillow periodically and it was not included. Other than that, I love this pillow; perfect support for my neck and shoulders. What can I say? This pillow is Fantastic!! Love the shape. I sleep on my side and it’s perfect, the cut out shape is amazing. Very firm. Wish that they would sale a pillow case with it. It does come with a cover but a pillow case in the shape of the pillow would be great. Overall you can’t go wrong with pillow. Buy it NOW!! This is an awesome pillow. I started having some back issues in recent months and have woken pain free since using this pillow. The memory phone is fantastic! I like this pillow, but I don't love it. I've tried every pillow imaginable,and this one is better than most, but not the best. I have terrible neck and shoulder problems, and the idea is great, but the pillow is a little too hard for me. Great pillow for a side sleeper! I would still like it a little higher but it's been great so far.